Cloud Printing is becoming another niche as current technological environment is changing radically in a short time and cloud printing can add extra advantage. Despite all the efforts for paperless office, the impression is that the load of paper has not been reduced that much. We can use the cloud as the solution to remove the printers from the office, to make it less bulky. Many of us still appreciate the paper print and the positive feeling that a print can offer can not be underestimated. Cloud Printing can help us to increase the flexibility – when and how to print. Cloud Printing so far has been successfully used to provide a way to help the mobile computing device users to use printers that would otherwise would have been out of question. We published before about Google Cloud Print in detail. Google Cloud Print is a feature that is available since 2010 and allows the users to print from mobile devices, controlling a printer of choice. The applications can print through the cloud by a web user interface. The service then sends the print job to a printer registered with the service. Originally, the printer to which the job was sent could have been a local printer connected to a computer connected to the Internet. Now more and more printers are cloud-ready and can connect directly to these services. There are other alternatives for both corporate and consumer customers such as HP ePrint, but the disadvantage of these cloud services is that each supports only printers of a specific manufacturer. These services also tend to work by sending an e-mail to the printer that you are interested in using with a mechanism that is not immediate. Many of these services are related to a particular technology or to a particular hardware vendor, though now the Cloud Printing Alliance, founded in 2011 – is working on the standard that allow the users and companies to be able to print from any device connected to a cloud to any printer. This research group has major supporters from the mobile field,and many printer manufacturers including Brother, Oki, Kodak, Konica Minolta, Lexmark are involved. 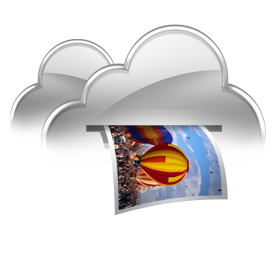 The main advantage of this effort, is in the fact that, cloud printing could be used on a multi-platform, ensuring compatibility with iPad, iPod Touch, Blackberry, Android and even Symbian, capable of fine printing of all the file formats and communicating with thousands of different types of printers. In any case, there are also cases of companies and large organizations that print tons of pages each year and would like to relocate the full printing facilities to reduce the cost of printing and hardware. Cloud Printing Providers, in this case can design a network of manufacturing facilities across the cloud to cut down the costs of printing. It is not easy for me to understand and implement the subject from here. Anyway, I would like to thanks for sharing and hope to see more posts in the future from you soon. Cite this article as: Abhishek Ghosh, "Cloud Printing : Standard Platforms and Multihardware," in The Customize Windows, December 2, 2012, April 21, 2019, https://thecustomizewindows.com/2012/12/cloud-printing-standard-platforms-and-multihardware/.